This will be a quick post today but I had to do some coloring and crafting just for sanity sake and this cute winter image from Bugaboo Stamps was on top of the pile of images which I have ready to color. I colored with ProMarkers and used a die from Spellbinders to cut the image and frame. The sentiment was part of the image set and I cut it with another die from Spellbinders, then inked the edges. The bow is one of those I sew up by the dozens but this one has a faceted gem instead of the usual pearl. That's a cute digistamp! Great card you've made. 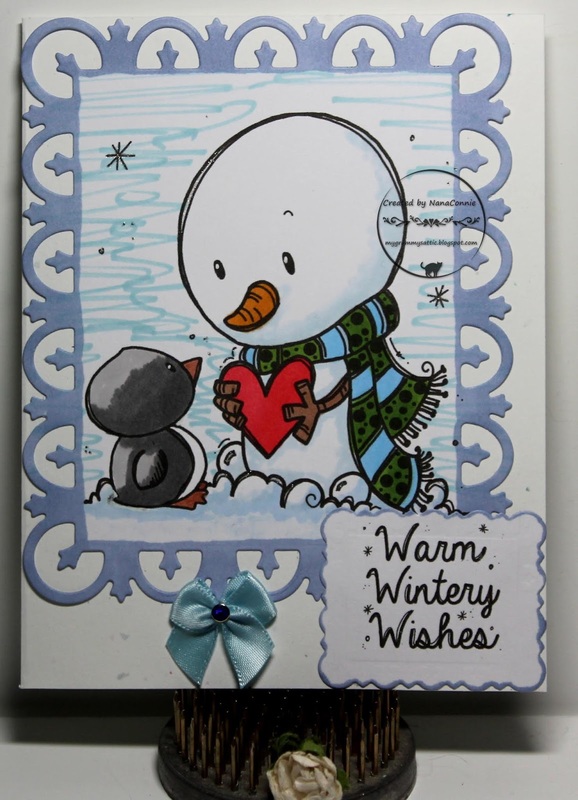 Gorgeous card, love the snowman! You blog header is adorable and made me swoon, just adore the kittens. Cute snowman image. I like bugaboo digis. They print out so clearly. Good luck with your craft room organization. I'm about to start mine as I can't find a darn thing on my desk and desperately need to put things back away where they belong. Hugs Mrs A.